The weather has been so unbearably hot and humid that we wished we have a pool at home. Now we have to have the air con on the whole night through or you can bet we cant sleep a wink.. I pray and hope that it will rain tonight. Electric bill will be extremely be high this month :p and what more with the electric rate increased in January ! Back to this melts-in-mouth jelly. It is the most awesome dessert ever especially under such a hot weather. Love it chilled ....it just melts in the mouth :) The texture of the jelly is not the firm hard type…mine is wobbly nice and melts in the mouth type with the soft succulent coconut meat giving extra oomph to the dessert..one word to describe it... AWESOME ! Make juz enough for a day or two. Can’t keep long becoz it has no preservatives. Mix coconut water , sugar syrup and the agar agar powder together and bring to a boil. Off the fire and sieve it before pouring into 8 ramekins. 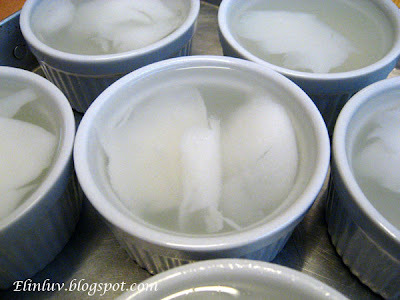 Add the coconut meat equally into the ramekins. When cooled, put in the fridge for at least 4 hours for it to be fully set . It will be slightly wobbly when you shake it. Serve in the ramekins only when ready to eat. It has to be in the fridge at all times. It is more blessed to give then to receive. 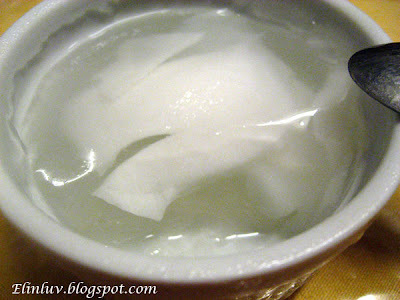 Elin, your coconut jelly is so tempting. Wish i could have one. I loved coconut water. Instead of agar agar powder, csn use the strands double swallow ones ka? Kathy, I am not sure how the texture will turn if you use the strip one... I have not tried it out with it and how much to use ;) you have to try and see...and let me know if they turn out wobbly anot.